Thermaco products are designed to help commercial kitchens like yours stay in compliance with local water and sewer regulations that prohibit fats, oils, grease (FOG) and other more solid kitchen waste from being introduced into the wastewater system. 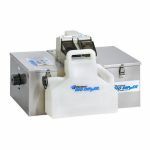 With Thermaco's Big Dipper grease removal technologies as well as their powerful, super-capacity Trapzilla grease interceptors, you don't have to worry what is draining into the wastewater. Thermaco products help you safely and efficiently meet foodservice regulations so you can focus on operating your business. Thermaco's Big Dipper Internal Strainer (IS) grease trap is an automatic grease interceptor that is designed to manage a single source of fat, oils, and grease (FOG) in a commercial kitchen, such as a three-compartment sink. Alternately a Big Dipper unit can be installed into the plumbing system to handle kitchen grease runoff and wastewater from multiple fixtures. The Big Dipper technology is small and compact, so a unit can be installed in locations where other large grease trap technologies could not. There is no manual operation of the grease interceptor. The Thermaco Big Dipper Internal Strainer (IS) System is an automatic, self-cleaning device. Convenient, easy, and clean.